Boxing doesn’t have to be expensive to get started. It’s a sport that requires some basic equipment, but that doesn’t mean it has to break the bank. Some of the stuff you’ll need you might already have at home. As with any sport, investing in quality equipment can have a direct impact on your performance and enjoyment. There’s no need for anything fancy, but having the right gear is important. Boxing is an extreme workout, so be prepared to feel the burn in every part of your body. It’s more important to buy the right boxing equipment than to buy the most expensive. So, let’s take a look at what you need. Whether you’re a total beginner or expert, the right boxing equipment can make all the difference in your training. Keep reading to learn what you need to know. There are two ways you can train for boxing: alone, or with a sparring partner. Training alone requires less equipment because you aren’t getting punched by anyone, so there’s no need for protective headgear or a mouthguard. Jumping rope is a great exercise for warming up. It builds strength in your legs and arms while helping you develop hand/eye coordination and stamina. Jumping rope works up a sweat and gets your blood pumping before a session of hitting the heavy bag. You have to protect your hands. They are your weapons. Hand wraps are a simple and effective way to protect them from Boxer’s Fracture while adding sturdiness to your punches. Your hands are full of tiny bones that can get easily broken or fractured, even with padded gloves on. Hand wraps also keep your gloves clean from blood and sweat. These are not the same as boxing gloves. They certainly aren’t for use in the ring. Punch mitts are for working on speed and accuracy outside the ring. Because they are light, they are perfect for developing punching precision. It’s a good idea to have a speed bag in your home gym for practicing fast punches. This is another great exercise for developing hand/eye coordination. Working a speed bag effectively requires skill, stamina, and reflexes. You will typically want to wear punching mitts to work the speed bag rather than boxing gloves because this discipline is about speed rather than power. Bag gloves look a lot like normal competition boxing gloves but are actually not as padded. Bag gloves are lighter than competition gloves but heavier and thicker than punching mitts. These are designed for punching the heavy bag. Bag gloves are an item you’d be wise to spend a little extra for. This is one place where quality counts because better gloves will save your hands. Get a good pair that has Velcro fasteners. Your hands will thank you. A heavy bag weighs close to 70 pounds and is designed to take hard punches. These are typically filled with sand or water, come covered in leather or canvas, and hang from a swivel. Working the heavy bag is where you will lose a lot of sweat and build muscle. Boxers spend endless hours pounding the heavy bag, so this is another area where we suggest not being stingy with your cash. Buy a good durable one that can handle many thousands of powerful punches. A timer is something you don’t need to invest a lot of money in. A cheap stopwatch will work just fine, though there are plenty of fancier options on the market. The purpose of a timer is simply to monitor your training session. It’s wise to keep track of how many minutes you spend on the heavy bag, speed bag, and jumping rope so that you can accurately track your fitness level, speed, and endurance. When you start sparring with a partner, it will not take long to figure out your true skill level. The heavy bag never punches back, whereas your sparring partner definitely will. You are going to take punches to the face and body, and these punches are going to hurt. So you are going to need more than the basic gear that you’ve used when training alone. Without headgear, you are going get knocked out early and often. Don’t be cheap when it comes to this boxing equipment. Spend money on quality. Headgear is designed to protect important stuff like your ears and brain. Punches will come hard and fast and will make contact with lots of soft tissue. Wearing good headgear is the first step toward reducing the odds of a concussion. Remember, you are going to get him in the mouth. Hard. Repeatedly. So, unless you plan to lose all your teeth, you’re going to need a mouthguard. A mouthguard doesn’t have to cost a ton of money, just makes sure it’s comfortable and allows you to breathe. The most common are “boil-and-form” that are designed to be softened in boiling water, then inserted into the mouth to form to the shape of your teeth. Or you can go the more expensive route and get one custom made. These are the heavier gloves you’ll actually wear in the ring. These are far more protective than punching mitts or bag gloves. They are heavier, with more padding. A body protector is an option for anyone not yet ready to feel the pain of body blows. This piece of equipment safely covers your most delicate body parts, including your groin. A body protector is intended for use during sparring sessions so that you can remain as bruise-free as possible. There’s no need spending any money on shoes when you start out. But, you’ll want good ones in the future. Owning a good pair of boxing shoes is more about moving around the ring without slipping. Boxing shoes keep you from slipping and falling down, especially when sweat and blood get on the floor. Investing in boxing equipment boils down to skill level. When you are starting out, there’s no need to buy more than the basics. You will train alone first, so items like headgear and sparring gloves will be unnecessary. Don’t get carried away. Start with a heavy bag and punching mitts. These are items you can easily use to workout in the garage or basement, and then add equipment as your skills and stamina increase. 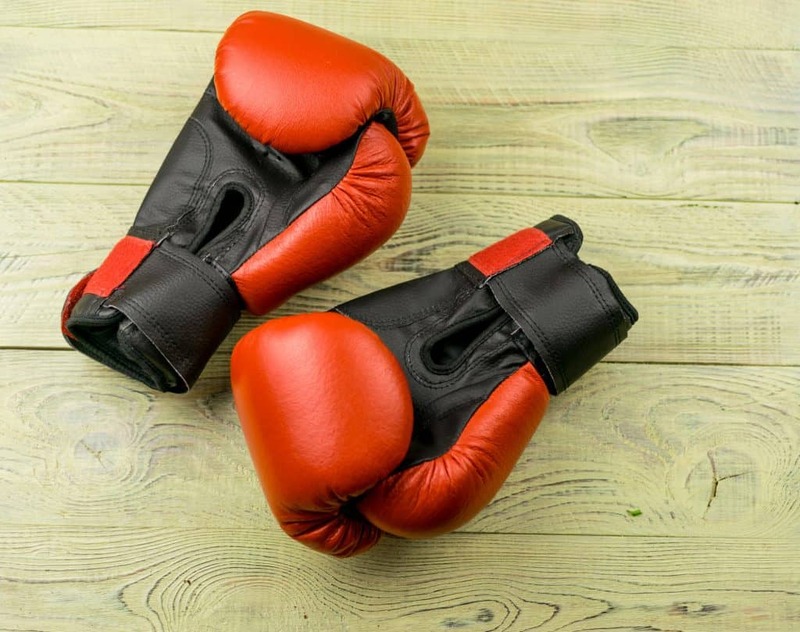 Click here for more great tips on finding the best boxing equipment for you.